A Ribble Valley grandmother has spoken out after she picked up 71 bags of dog mess on her country walk in Clitheroe. 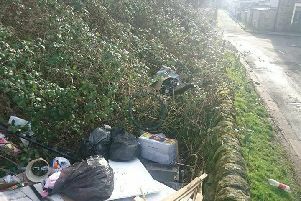 Public spirited Amanda Townsend, 46, from Clitheroe cleared away the dog excrement after she discovered the shocking haul on her walk along Four Lane Ends on Monday. The path is reported to be popular with dog walkers, runners and and bikers, and is frequently used by many local families with young children. The outraged dog walker was horrified to find the appalling mess and has appealed for other dog owners to act responsibly and clear-up after their pets. She said: "I can't understand why anyone with a dog would not clean up after it. It's a disgrace. "This lane is used by children, grandchildren, dog walkers, bikers and walkers and it was covered in excrement. "Would you let your dog foul in your lounge, or on your own path or where you walk or your children play? "No, so don't just leave it where everyone else's children play and walk. It's not rocket science. "I buy nappy sacks that cost 39p for 100 so there is no reason for anyone not to be able to afford some. "If I see anyone who doesn't pick their dog mess up I tell them their dog has just fouled and make sure they clean it up. "If you have a dog you have to clean up after it, it's that simple. "Do the right thing, pick it, tie it, bin it. Simple." Ribble Valley Borough Council officials have revealed that they spend £30,000 a year disposing of dog foul and receive around 200 complaints regarding the problem. The council has warned irresponsible dog owners that where an owner does not pick up and dispose of their dog's faeces it will will consider prosecuting them. Failure to pay the penalty could result in a prosecution and the offender may be fined up to £1,000 in court.